Image Copyright © 2009 ILR & guyallen-art.com We at the International Lamborghini Registry appreciate the assistance we have received from around the globe. The accuracy of the information presented on these pages is dependant entirely on information received from many different sources. This information is compared with other sources and painstakingly researched in order to arrive at the most accurate results. Any wishing to submit photos, vehicle histories, serial number lists and other information are invited to do so by e-mailing these to us or sending them by regular mail to the postal address below. Any emailed photo attachments (scanned at 150dpi) should be tightly cropped and saved as a jpeg at the highest quality setting. 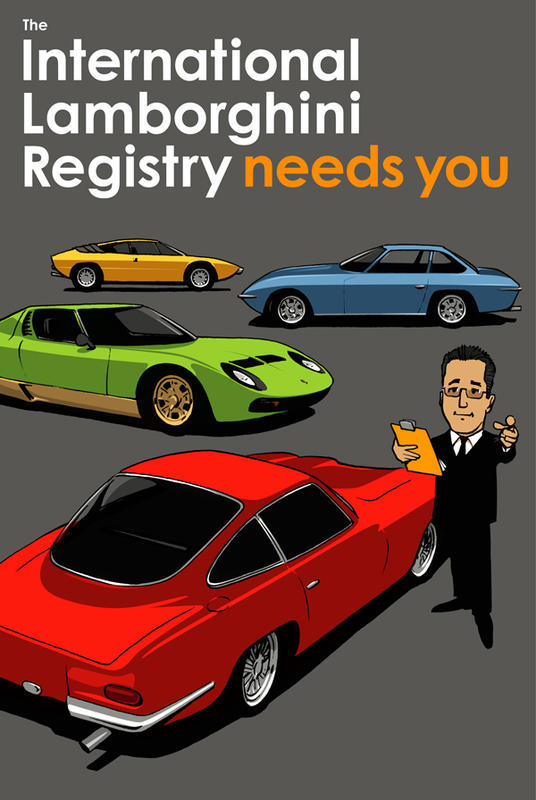 Please try to include the serial number of the vehicle as part of the file name and in the email subject line in order to make it easier for us to keep track of and better sort sumbissions and reference photos to information on individual cars. Attach a couple of photos (interior, exterior, engine, luggage space, front 3/4 view, rear 3/4 view, etc.). Please also rename the attached photos to include the chassis number and appropriate description (eg: #8502interior.jpg).